Daily Cheapskate: 15% off Artisanal Honeys at Crafted Kosher; order now for Rosh Hashana and Sukkot. 15% off Artisanal Honeys at Crafted Kosher; order now for Rosh Hashana and Sukkot. Forget the honey bears! CraftedKosher.com has got a great 15% promo code on the Savannah Bee kosher Artisanal Honey Collection! Enter promo code SAVANNAH15 at checkout to get 15% off all Savannah Bee Artisanal Honey at Crafted Kosher. On a personal note, I'm absolutely thrilled about this promotion. 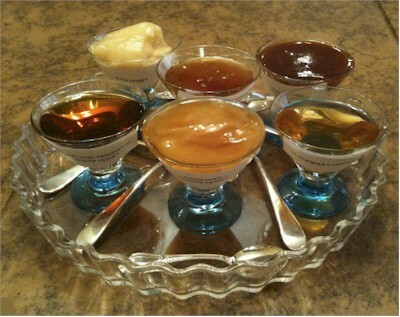 For the past few years, I've been stealing an idea from an old Susie Fishbein cookbook: on Rosh Hashana, we put out a honey-tasting platter with different types and infusions of various artisanal honey. You would be surprised how different the various types of honey taste. It's always a challenge to find the exotic infused honeys at a great price and with a good hechsher. A lo and behold, Savannah Bee has done the legwork for me this year! I'm buying the 3 oz. Savannah Bee Artisinal Lavender Honey for $5.99 $5.09, and the 3 oz. Savannah Bee Artisinal Rosemary Honey for $5.99 $5.09 and the (OMG) 12 oz. Savannah Bee Whipped Honey with Passionfruit for $13.29 $11.30 (post promo-code prices). Hurry because I have no idea how long Crafted Kosher will keep this promotion running and some Savannah Bee items are already out of stock. For a limited time, you'll get $5.99 flat-rate shipping or free shipping on orders over $75 (except for perishables, like the cheese, where the shipping is kind of pricey). FYI, the kosher items from the Savannah Bee Honey Company are under KSA Hashgacha.